It’s an exercise many college students dread. On the first day of class, a professor often will ask pupils to share their names along with accompanying “fun facts.” Nervous fidgeting and sweaty palms follow as 18- to 22-year-olds strive to come up with something — anything — that will make them sound interesting. Heads would turn, and O’Dea would answer the inevitable follow-ups. Fire dancing, he’d explain, involves “whirling around fire really fast in intricate patterns” set to music. It’s a unique hobby and one of a host of factors that make O’Dea a fascinating member of the class of 2015. O’Dea’s circuitous journey to South Bend began 8,000 miles away in Manila, the capital of the Philippines. At 11, he moved to New Jersey when his mother married an American. He excelled in the classroom and on the fencing team at Don Bosco Preparatory High School. He was admitted to Notre Dame, his “dream school,” but O’Dea felt called in another direction. Inspired by campus ministry work and the example of a priest at Don Bosco, he was drawn to the Salesian order and entered the seminary at Seton Hall University. Because the order focuses much of its ministry on young people, some Salesian seminarians use their spare time to develop skills that will entertain children. O’Dea started with juggling and magic tricks. One day he saw footage of a fire dancer and was hooked. He watched and re-watched instructional videos online. He never took lessons and to this day has only met one other fire dancer. Fire Poi, the particular discipline O’Dea taught himself, has its roots in New Zealand. Poi, his instruments, are chains with a handle on one end and a cube made of Kevlar attached to the other. The cubes are dipped in lighter fluid and set on fire, and the Kevlar keeps them from burning out quickly. O’Dea began by practicing with safer, glow-stick poi. “I picked up the moves fairly naturally,” he says. “It was almost addicting.” After 18 months of training, he performed using fire for the first time at a Salesian summer camp for high school students in Tampa in 2011. Eventually, O’Dea felt God leading him away from the priesthood. He re-applied to Notre Dame and moved into Sorin as a junior in autumn 2013. His poi made the trip, too. 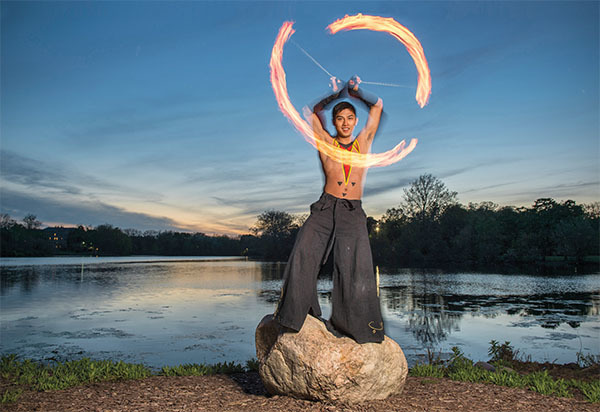 O’Dea joined the Irish fencing team, but he also began fire dancing at campus events. He spends weeks preparing for each performance, choosing a song and listening to it over and over until he’s mapped out his routine. He practices for hours with his glow-stick poi, so that by the time he takes the stage, his fast-moving arms come together in beautifully choreographed, fiery harmony. “I get to lose myself in the music,” he says. He prides himself on taking every necessary safety precaution, so he has never injured himself or others. O’Dea and his poi are making another move this summer as he embarks on a career as a theology teacher. Through the Providence Alliance for Catholic Teachers, a two-year Providence College program similar to Notre Dame’s Alliance for Catholic Education, O’Dea will begin in the fall at St. Raphael Academy, a Catholic high school in Pawtucket, Rhode Island. He doesn’t know how much time he’ll have to practice or whether he’ll be able to convince his principal to let him start a fire dancing club. But when he stands in front of class for the first time, the teacher will have an easy way to introduce himself and command the room’s attention. Kevin Brennan is the alumni editor of this magazine. Originally published by Kevin Brennan ’07 at magazine.nd.edu on July 06, 2015.